LOUISVILLE, Ky. — Louisville City FC (2-1-0, 6 points) thundered back against Orlando City B (0-2-1, 1 point), winning 4-1 on Saturday at Louisville Slugger Field after battling back from an early deficit. Goals by Chandler Hoffman, Andrew Lubahn, Man of the Match Kadeem Dacres and Ilija Ilic led LouCity to its first home win of the 2016 campaign. Despite OCB striker Michael Cox opening the match’s scoring with a 5th minute goal, LouCity rallied. Coach James O’Connor’s men both anchored down defensively, allowing no goals during the next 85 minutes, and pushed forward with great success, scoring four goals for the match. O’Connor said he was pleased with his team’s attacking prowess in the victory. LouCity controled possession for much of the game and looked threatening throughout. O’Connor, who often preaches “possession with a purpose” was happy with the pressure his team put on Orlando City B. One man who possessed with a purpose was Dacres. Dacres assisted Hoffman’s first goal as a Louisville City player in the 26th minute, equalizing the game. Dacres later scored with one of his own in the 65th minute from about 25 yards away. O’Connor said he was impressed with the Modelo Man of the Match’s goal, in addition to his teammates’ work ethic. Former University of Louisville Cardinal, DelPiccolo, had his first assist as a Louisville City player after firing a free kick to Lubahn, who headed in the go-ahead goal in the 47th minute. DelPiccolo gave credit to Lubahn in finishing the goal. A fourth goal by Ilic in added time put the icing on the cake for LouCity. O’Connor was pleased with Ilic’s goal — and the buildup — after the striker came on in the 78th minute for Lubahn. The 4-1 victory wasn’t all about offense, though. LouCity cracked down in their own half after conceding the early goal. Defender Sean Reynolds, who had several key tackles in Saturday’s showdown, said the key to shutting down OCB was sticking to the script. Louisville City will take on FC Cincinnati at FCC’s Nippert Stadium on April 16 with a 7 p.m. kickoff. Today’s match is the first time Louisville City FC and Orlando City B have faced off. LouCity coach James O’Connor played for Orlando City SC, OCB’s parent club, from 2012-14. He also worked as a player coach with the club. 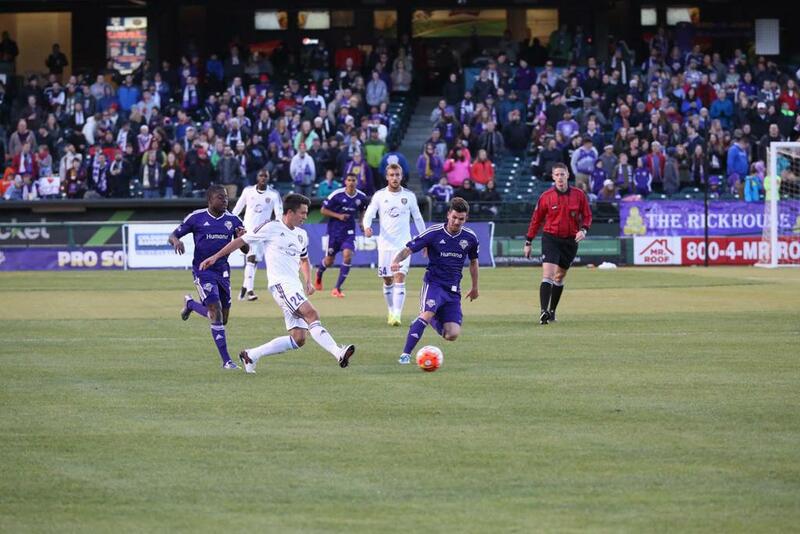 Last season, LouCity played in a friendly against Orlando City SC and defeated the Major League Soccer side by a score of 3-1 at Louisville Slugger Field in 2015. Orlando City B coach Anthony Pulis is the son of English Premier League manager Tony Pulis. Orlando midfielder Tony Rocha was suspended for today’s match after picking up a red card in OCB’s last game against Charleston. Weather: 46 degrees; cold and clear. OCB: 5th Minute Michael Cox: OCB forward Richie Laryea left a nice back heel for fellow striker Michael Cox. Cox steadily put the ball past LouCity keeper for the first goal of the game. LOU: 26th Minute Chandler Hoffman: Kadeem Dacres made a beautiful run down the left side of the field and crossed it to Chandler Hoffman, who was able to score and equalize for LouCity. LOU: 47th Minute Andrew Lubahn: Midfielder Paolo DelPiccolo put a beautiful swinging free kick in the air from the right side that Andrew Lubahn was able to head home. The goal gave LouCity a 2-1 lead. LOU: 65th Minute Kadeem Dacres: Dacres was able to hit a beautiful bending strike from around 25 yards away, beating Orlando keeper Mark Ridgers. LOU: 90th+ Minute Ilija Ilic: Ilic linked up nicely with midfielder Niall McCabe in the center of the box, allowing the Serbian striker to tap the ball in past Ridgers. LOU: 66th Minute Scott Goodwin: Goodwin made an impressive diving save after an OCB attacker made a good shot on goal. LOUISVILLE, Ky. — Louisville City FC (2-1-0, 6 puntos) regresaron a ganar el partido con un marcador de 4-1 contra Orlando City B (0-2-1, 1 punto) después de un déficit temprano el Sábado en Louisville Slugger Field. Goles de Chandler Hoffman, Andrew Lubahn, el Hombre del Partido Kadeem Dacres y Ilija Ilic ayudo a LouCity ganar su primer partido en casa de la 2016 temporada. A pesar de un gol en el quinto minuto por el delantero de ORL Michael Cox, LouCity recuperaron. Los hombres del entrenador James O’Connor aseguraron la defensa, no dejaron a ORL anotar un gol durante los próximo 85 minutos, y empujaron hacia adelante con éxito, anotando cuatro goles en el partido. O’Connor dijo que estaba contento con el ataque en la victoria. LouCity controlo la posesión para la mayoría de el partido y parecían amenazar a través del partido. O’Connor, quien con frecuencia predica “posesión con objetivo” estaba feliz con la presión que su equipo pusieron sobre Orlando City B.
Un hombre que poseso con un objeto fue Dacres. Dacres asistió en el primer gol de Hoffman como un jugador de Louisville City en el 26 minuto, empatando el partido. En el 65 minuto Dacres anotó su gol aproximadamente 25 yardas del gol. O’Connor dijo que fue impresionado de el gol de el Modelo Hombre del Partido, además de la ética del trabajo de sus compañeros. El ex jugador de la Universidad de Louisvlle, DelPiccolo, tuvo su primer asistencia como un jugador de Louisville City después de tirar un tiro libre a Lubahn, quien anoto el gol de la victoria con su cabeza en el 47 minuto. DelPiccolo le dio crédito a Lubahn de anotar el gol. El cuarto gol por Ilic in el tiempo extra seguro la victoria para LouCity. O’Connor estaba contento del gol de Ilic- y como se desarrollo- después que el delantero entro por Lubahn en el 78 minuto. La victoria de 4-1 no fue todo de el ataque. LouCity aseguraron la defensa después de conceder un gol temprano. Defensor Sean Reynolds, quien hizo varios jugadas claves en la defensa, dijo que la clave para parar ORL fue quedándose a el plan. El próximo partido de Louisville City FC será en FCC’s Nippert Stadium el 16 de Abril a las 7 p.m. contra FC Cincinnati.